On the eve of a million-dollar race in the glamorous Sun City, it seems that pigeon-racing has come a long way from its working class roots. But for one man, it's all about love, not money. As a teenager Nev Proctor would emerge from the darkness of Norton coal pit near Stoke-on-Trent and rush home, hob-nail boots clattering on the country lanes, back to his pigeon loft. As he cradled the birds in his hands, with his dirty face fanned by the gentle breeze from their wings, Nev would dream of beating the old boys down at the local pigeon club and maybe even of winning at the nationals. But now over 50 years later, the 68-year-old has a much bigger prize in his sights. On Saturday in South Africa three of his birds will compete in what those in the know describe as the Olympics of pigeon racing. The Sun City Million Dollar Pigeon Race, held at South Africa's answer to Las Vegas, will pit 4,300 birds from 25 countries against each other for a share of $1.3m in prize money. The runners-up get cars and the overall winner can expect to pocket $200,000. 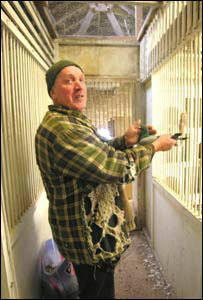 This is the new face of pigeon racing and it is a long way from the ale-and-flat-cap stereotype. The membership of local working-class clubs in England has been steadily declining, but fanciers like Nev say the Sun City race has drawn a new generation into the sport both from the UK and across the world. And with top-breeding race birds occasionally going for more than $100,000, some of the international racers are a very long way indeed from being working class. But the big innovation is not in the exotic location and high prizes, it is in the transformation of pigeon racing into a spectator sport. In its traditional form, pigeon racers train their birds to fix their bearings to their own particular loft (pigeons do this only once, rather like a duckling with its mother). On race day they bring them to a single release site, along with the other racers, and set them free. The owner then waits anxiously back at home for his pigeons to arrive. As soon as they land he enters their leg-ring numbers into a special tamper-proof clock. Because each loft is a different distance from the release site, the winner is decided by dividing the distance from release to home by the time the bird took to get there. But in Sun City's so-called "one-loft" race, birds from across the world are air-freighted to South Africa as chicks months before the race and trained to orientate to a single loft. Then on race day, after being released 550 km out on the South African veldt, the birds all hurtle back to the same destination. Waiting for them are thousands of enthusiasts gathered in Sun City's sports arena, straining for the first glimpse of a speck of pigeon on vast screens filled with empty blue sky. For Nev, there just simply isn't anything quite like it. "It's electrifying. Any pigeon man, you just can't keep yourself still, that last half hour, they can't keep their eyes off the screen," he says. "When you see one come in and pitch in, the hairs on the back of your neck stand up and you can't talk right. "When you see one come up the road and just pitch into that cot, it puts a lump in your throat. I've had pigeons 50-odd years and it still does the same. "A lot of people don't realise what the pigeon has done for you, it's flew its heart out." No-one really knows how racing pigeons find their way home. Some believe they use the angle of the sun and the sound of waves crashing on distant coastlines. There is evidence they can detect the earth's magnetic field. But what is clear is that pigeons released hundreds of miles from home, at locations they have never been to, can return faster than the people who let them go. This will be the third year Nev has entered birds at Sun City. In 2006 one of his pigeons came ninth, in 2007 another came in at 29th. Out of a field of thousands of the best birds in the world, this is a huge achievement. And although he refuses to nail down a figure, Nev says he has already won tens of thousands of pounds. But seeing Nev with his pigeons, it's clear he isn't doing it for the money. The loft is airy and calm. The birds flutter between the rows of white wooden nesting arches and coo contentedly to themselves. And Nev seems to coo back to them as he carefully strokes their feathers, lets one of them peck at his fingers, and chats about the arcane business of breeding and lineage. Some of the old breeds he can trace back 50 years and his pigeons are part of his family. "You talk to your pigeons, I tell you that, you really talk to them, and I'm sure they listen," he says, adding: "Like children, all they know is the love you give them." Nev still vividly remembers his first race when he was 15. He says he was hooked from the moment he watched his two birds turn and rocket into the loft and saw the astonishment of defeat on his older brothers' faces. 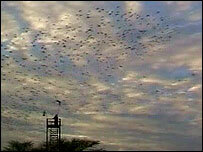 On Saturday he will be staring up once again, hoping for the first glimpse of his brave birds streaking out of the African sky. I used to keep pigeons when i was young and i can fully understand the passion of the doo men. I would be interested to know what is the overfly for the pigeons flying to the UK, that is how much extra time does the bird get to fly home to the UK than the African birds. You want to try living next door to a pigeon loft! I have small children so our back garden has become a battle zone with my neighbour who is constantly complaining that my kids are disturbing his pigeons. His garden is full of sheds which are unsightly and during the summer we get infestations of flies and rats. Its made our life hell so we are forced to sell-up and move elsewhere. I hope I never see a pigeon again. I really do hope that they will grow-up and that this sad hobby dies-out. It really warms my heart to hear people speak so affectionately of their animals - whatever the type - and obviously have so much love for them. I wish Nev and his birds best of luck and many happy races! Good luck Nev. It's always a pleasure to see someone who does something for the love of it. OK so he's won a few quid but I'll bet he's put in thousands of hours looking after those birds and even if there wasn't any prize money he'd still do it. Maybe we can't beat the world at football or rugby but at least our birds can show them the way home. My Husband's life was his pigeons, so much so I had just given birth to our youngest Daughter in the front room as we did in those days! !, When he came in from work the pigeons had to be fed first before seeing our new baby, I was not happy!! Also my children and I never got a holiday, the answer to that was "well we live at the seaside" "and I can't leave the birds" so Nev don't neglect your family in favour of the birds. Good luck in the race. As a child I watched as crates of pigeons came in the goods vans of the local 'puffers' to our little station to be released at the given hour by the stationmaster with his official railway watch aided by two porters! Now its not so romantic as a truck pulls up and its sides open . . . At least these birds are treated with love, better than the care given to greyhounds. I wish Nev every success and hope his birds come in the winning group! Exciting stuff! There is actually a 'one loft race' in Scotland every year. Its been going a number of years now and good prize money. With reference to John Pitt, Glasgow. The birds are sent to South Africa to acclimatise and placed with a trainer who enters them in the race, the owner might not see the bird until it registers at the finish line.